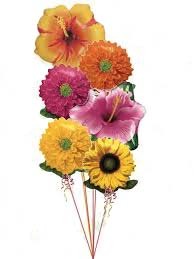 A complete masterpiece of flower balloons designed for those hospital deliveries where latex balloons are not allowed. A marvelous and uplifting display! Option #1, Bouquet of flower balloons attached to a foil weight, as shown, $42.